From observation, the planet is hotter and much more arid than Earth. Although there’s no way of calculating absolutely the surface temperature of a world (we can’t even do that for Earth), there are some aspects that need to be addressed. The atmosphere is thinner than Earth’s, although not to the degree that Humans can’t acclimatise. One problem with this is a thinner atmosphere should retain less heat than Earth’s, leading to cooler temperatures. Since it is thinner, “greenhouse” gases like carbon dioxide aren’t likely to make a big difference. The thinner atmosphere is also likely to offer less of a barrier to harmful radiation than the Earth’s atmosphere does. I would speculate that the answer is dust. Vulcan’s sky (like Mars) has a very distinct red colour. 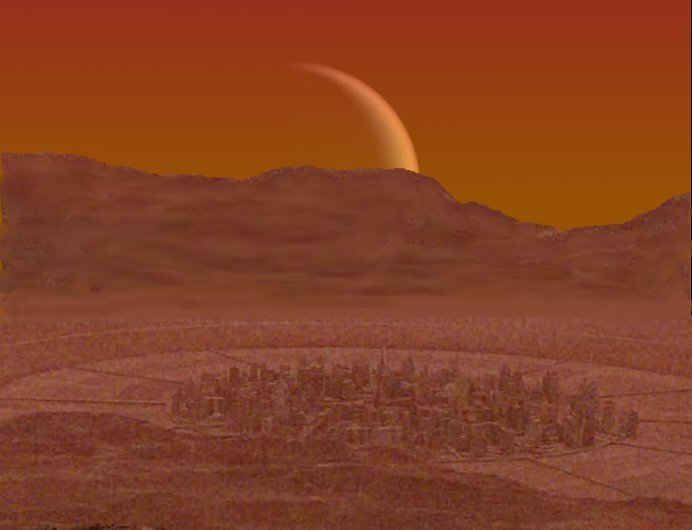 The red skies of Mars are caused by fine dust suspended in the air. There’s no reason why a similar mechanism might not operate on Vulcan. Since the “thin” Vulcan atmosphere is still many times more dense than the atmosphere of Mars, a great deal more dust could be held in the air. This is likely to trap heat, and diffuse light and other radiation, making Vulcan warmer and with less ultraviolet light than might otherwise be the case. I would also think that Vulcan has a very intense magnetic field, made stronger rather than weaker by the close proximity of a companion world. This should lead to stronger equivalents to Vulcan’s Van Allen belts, again reducing the dangers of radiation from the system’s stars. The magnetic fields may also hold even more dust, since the red colour of the dust seems to indicate a high iron content. One aspect of the unusually thin atmosphere will be that it tapers off less with altitude, again helping to trap heat more than might otherwise be expected. The end result (I hope) is that average temperatures on the surface of Vulcan are higher than those on Earth. It has already been suggested that Vulcan has a low degree of axial tilt (one example is the “U.S.S. Enterprise Officer’s Manual” by Geoffrey Mandel, published by Interstellar Associates in 1980), meaning that there are no real “seasons” on the planet. The tropical areas of Earth tend to only have two seasons, and I suspect that the seasons on Vulcan are similar: a “hot” season and a “very hot” season. In making this guess, each season will last half a year, and so there will be four to an r’tas. That means that 2.8 Earth years is equivalent to 9.6 Vulcan seasons. That’s as close as I can get to the suggestion that 9 Vulcan seasons is equivalent to 2.8 Earth years, made on page 21 of “Star Trek: The Motion Picture” by Gene Roddenberry (published by Pocket Books in 1979). It might be stretching things slightly, but it doesn’t absolutely contradict it. Another result of the low angle of tilt is that there are less likely to be polar icecaps. If the water on Vulcan was limited to a scattering of lakes, then I don’t think the planet would have enough water to support life, except in a very marginal way. Either there are some small seas (and there is some evidence for them) or a lot of water in underground basins. I think there is a mixture of the two. I’d also suggest that Vulcans are very particular about the use of water, especially groundwater. Managing the resource is vital to the viability of their society. Even then, the arid conditions will mean a lot of the planet’s surface is high desert. Whilst Vulcan life is evidently much better adapted to cope, there are limits. It may be that even in the 23rd and 24th centuries, parts of Vulcan are still mainly inhabited by wandering nomadic tribes, although they will be a full part of Vulcan society, and not “primitives” in the sense we would use the term. One aspect of my model is that Vulcan will be a planet of two hemispheres. One will face the companion world, one won’t. With a low level of axial tilt (but not no tilt at all) the two worlds will eclipse each other often, rather than always. Even so, I think that the number of times the companion cuts off sunlight to Vulcan partially or completely will be quite high, possibly enough to make the “inner” hemisphere of Vulcan relatively cooler. It’ll still be a hot desert by our standards, but less so than the “outer” hemisphere. This would mean that there would be more water, meaning more opportunities for agriculture and settlement. My speculation is that Vulcan civilisation is a product of the “inner” hemisphere, and the importance of the companion world featured in Vulcan religion. 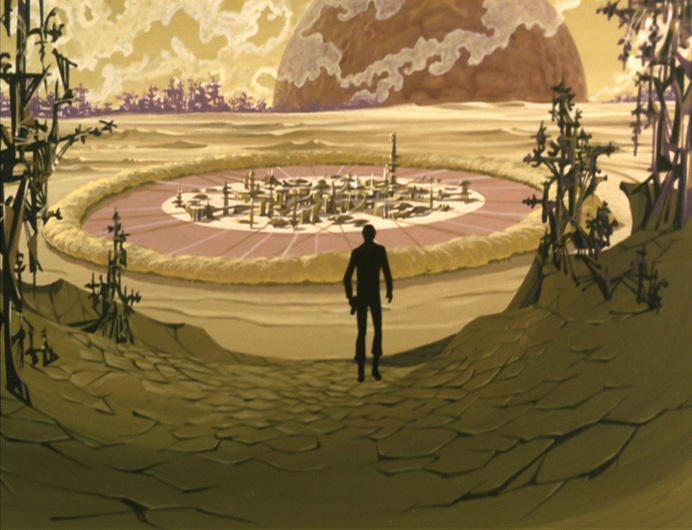 Certainly the companion is much further up in the sky when the Highlands of Gol are shown in “Star Trek: The Motion Picture” than it was in TAS “Yesteryear.” The obvious explanation is that Gol is much closer to the centre of the “inner” hemisphere than the city of ShiKahr, where the companion is right on the horizon. This raises the intriguing possibility that Mount Seleya is so important in Vulcan culture because it is almost directly in the middle of the “inner” hemisphere, right under the companion. It’s never been shown, but maybe if you look straight up into the sky, there’s an enormous planet hanging right overhead. Having worked out the masses and radii of Vulcan and its companion, I can calculate that the two will be separated by 9.6 Earth radii. In practice, if we’re looking from somewhere close to the middle of the “inner” hemisphere, the observer will only be 8.56 radii from the companion, making quite a difference in the apparent size. I’ll play around with the GIMP and try to make an “accurate” image of Vulcan’s sky (of course, it’s not real, so the sky looks however you want it to). How will the planets be illuminated? The sun will be shining fully on the hemisphere of the companion facing Vulcan when it’s midnight at the centre of the “inner” hemisphere. Conversely, when it’s mid-day at the same location on Vulcan, the hemisphere of the companion facing Vulcan will be in darkness. This means that the companion will undergo a complete set of phases from full, to new and back to full every day. The same will be true of Vulcan in the companion planet’s sky. The phases of Vulcan’s companion don’t work terribly well. It seems to be fully illuminated during the Vulcan day, and completely dark during the Vulcan night in TAS “Yesteryear,” which seems unlikely, although an eclipse might explain the night scenes. The screencap from “Star Trek: The Motion Picture” seems to be showing sometime early in the morning, with the sun rising off to the right, and still quite low in the sky. That means the companion world should be about half full, as should any “moonlet,” if it’s in sunlight. Oh. Well, I have a huge “thing that’s not a moon” in the sky, but the similarities are, putting it kindly, limited. Of course, the angle of view isn’t likely to be 40° in widescreen, but there’s no way of knowing exactly what it is. What if it’s a lot less, as it would be using a zoom lens? OK, it’ll need to be a big zoom, but there are limits to how big you can get something in a planet’s sky and still have some sort of plausible explanation for it. The same twin planet closer in means a shorter day. A bigger companion planet will mean a much longer day, and where’s the ice-planet going to be when you do that? You will also doubtless have spotted that the two objects in Vulcan’s sky in the screencap are illuminated on one side, with a (slightly) shadowed side. Unfortunately, they’re being lit from exactly the opposite direction as the surface of Vulcan is in the foreground. Of course, “there are always alternatives.” Is it possible for the companion world to get bigger and smaller in the sky? Technically, yes it is. I’ve been assuming that the two planets circle each other at a fixed distance. What if that distance shifts? The first point is that it will have to shift a lot to accommodate TAS “Yesteryear” and “Star Trek: The Motion Picture”. The second is that once you change the distance between the two worlds, the tidal forces will vary. Fixed, they create a fairly stable “bulge” in the surface of the world. Move the planets closer together and further apart, and that changes. The whole planet will “flex,” and the sort of forces involved are unlikely to make either Vulcan or its companion places where anything can live. Nonetheless, I was curious enough to play around with Universe Sandbox, and confirmed my suspicion that the moonlet becomes an impact crater on the companion world very shortly after you vary the distance enough for it to make a difference. I can only say it’s up to the viewer to decide whether (technical shortcomings aside) it can be an acceptable replacement for the “real” image. Thanks, TrekCore. Once again, we don’t know the exact field of view, and it’s moments before Vulcan gurgles off down the galactic plughole forever, so the diameter of the planet might be somewhat smaller than usual. In practice, the size of Vulcan in the sky is going to be almost identical to the size of the companion in Vulcan’s sky. The phases of Vulcan will follow a similar pattern, too. So how is it Delta Vega? The possible answer occurred to me when I spotted the top secret Genesis Project in “Star Trek II: The Wrath of Harrison Khan” was run from a facility called Gamma Regula, that didn’t appear to be anywhere near the star Regula (because the Mutara Nebula has to be close by). What if it’s a Starfleet codename? “Delta Vega” fits the same pattern, so maybe in the Prime Universe it got assigned to a lithium cracking station, whilst in Nero’s Divergent Timeline it gets attached to Scotty’s “back end of nowhere” base on an ice planet with a nice view of Vulcan. It’s as close to an explanation as I’ve been able to get, anyway. By long fan association, the name assigned to the thing in the sky over Vulcan is T’Khut (also spelled T’Kuht; I’m using the spelling that stays consistent with my adopted month names). It’s as good a name as any, and better than I could make up on the spur of the moment. Like Vulcan, the day will last 1.113 Earth days, and the time for an orbit around 40 Eridani A will also be the same as for Vulcan. T’Khut’s axial tilt will be the same, too. That means that it’ll have a similar lack of seasons, although where Vulcan is hot all the time, T’Khut will be cold. My assumption is that the temperature all over the planet is permanently below the freezing point of water, and the supposition that a lot of Vulcan’s water has ended up on T’Khut means that there is a lot of frozen sea covering the surface, certainly more than two thirds of it, and possibly as much as three-quarters, with plenty of water left over for a thick and permanent ice and snow cover for the land areas. For Humans, it’s inhospitable. For Vulcans it will be virtually uninhabitable. They’re adapted for heat, not cold, and a thin atmosphere, not a thick one. Whilst it is close to Vulcan, and must have been visited, it’s safe to assume that it has no large population. 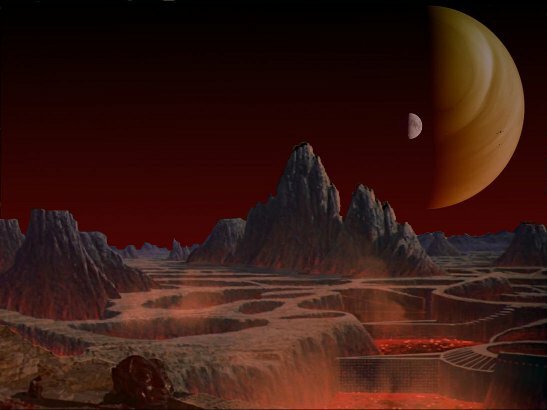 Although it might have been an obvious emergency destination for Vulcans when their planet was destroyed, it isn’t a plausible candidate for “New Vulcan.” Apart from the surface conditions, the planet is either in close proximity to a microscopic black hole (not good), or is one half of a double planet system that’s lost a planet. In that case, the planet will have an unstable orbit, not to mention some huge adjustments to the tidal stresses on its surface. That could be even worse as a potential world to settle. Has it always been an ice-world? I don’t think so. What we see of life there suggests that there was a prolonged period when it had the same sort of conventional “Earthlike” surface conditions that Vulcan needed for life to get a good start. When the planet froze is anyone’s guess. I would favour a natural process, possibly some severe volcanic eruptions at just the wrong moment, leading to a really severe ice age. Equally though, the possibility remains that it was a “nuclear winter” triggered by the Vulcans at some point in their past that started the ice age. My point being that it’s not a stable or permanent condition. If something were to reduce the albedo of the planet, then it would begin to warm up. If enough of the water melted, then the process would be irreversible, and T’Khut would become a hot water world, still not a great place for Vulcans, but a holiday paradise for people from Earth. Of course, the process might go to the other extreme, with carbon dioxide in the thicker atmosphere creating runaway warming and leading to conditions on the surface similar to Venus. That obviously hasn’t happened in the past, so I’d argue that it isn’t likely. One possibility is that the greater area covered by seas would dissolve more of the carbon dioxide out of the atmosphere, keeping the overall temperature stable. My own guess is that T’Khut has been an ice world for the whole of Vulcan history, and is likely to remain so for the foreseeable future (all bets are off in Nero’s timeline, but that’s not up to me). This one is a bit of a mystery. The five seconds or so it’s visible in “Star Trek: The Motion Picture” is all we ever see of it. As I said earlier, I’m not at all sure that there’s any way a smaller moon could orbit one of the two main worlds without the orbit being affected by the other world. I think a very big crash is the most plausible scenario, and I don’t think it would take terribly long to reach that point. So, assuming that the orbit is surprisingly stable, can I suppress my doubts and try to come up with something? After playing around with Universe Sandbox for a while, it seems plain that the moonlet must orbit very close in to T’Khut in order to avoid being pulled into a collision with one or the other of the two bigger worlds. Too close in, and atmospheric braking will send the moonlet into the surface of T’Khut, though. Things seemed relatively stable when I set the orbital period at a little under three and a half hours, although the influence of Vulcan meant that the length of the orbit varied quite a bit. I’m really not sure that leaves the moonlet a great enough distance from T’Khut, but it’s the best I can manage. Solving the three body problem seems a bit ambitious for me at this stage. I suggested on the Pon farr page that Vulcan (and T’Khut too) have much greater concentrations of the mysterious element kironide in their surface layers than Earth. As you doubtless recollect, TOS “Plato’s Stepchildren” explained that the psychic powers seen in “Star Trek” are caused by kironide in the diet. Why would Vulcan have lots, and Earth practically none? I’m basing that conclusion on the fact that kironide so far remains undiscovered on Earth. It may also be that the obviously fraudulent nature of psychic powers claimed by people on Earth might be a clue too, but I’ll leave that to the reader. A possible explanation that’s occurred to me is that the explosion of 40 Eridani B as a nova in the distant past created all kinds of exotic substances, and then sent them flying onto the surface of nearby Vulcan. Kironide is just one of them. I would speculate that kironide isn’t anything like as common on Vulcan as it is on the Platonians’ planet. The sudden powers Doctor McCoy gives everyone are caused by a massive dose, much bigger than could be obtained elsewhere. Vulcans would then absorb a limited amount of Kironide, probably early in their lives. That would go some way to explaining why Amanda doesn’t become obviously psychic after moving to Vulcan, why Vulcans don’t seem very keen on establishing colony worlds (compaerd to Humans, for example) and how it is that Romulans need to kidnap telepathic Andorians. Romulus is presumably as deficient in kironide as Earth. If you think that’s a remarkably ingenious idea, it is. I ripped it off from Poul Anderson’s novel “Satan’s World”.